a shot of emotionalism, anyone? 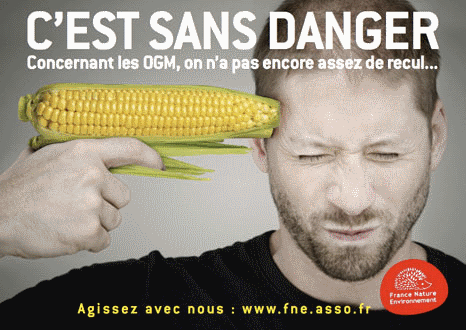 There is now the real danger of GM food crops making their way into our food system. Monsanto and its subsidiaries are responsible for engineering GM food crops. This could be seen as a stroke of genius or the work of the devil, depending on where you sit in this debate. It can be seen as a natural extension of what man has been doing since he first domesticated wild plants for food production or, as so many believe, it is a line that should never have been crossed. These plants are scientifically designed for specific traits such as drought, pest and pathogen resilience and, in the case of the tomato, the ability to be fully ripened without being soft and squishy. The growing of GM foods will continue to be very controversial. As you can see, this fourth paragraph from Mark Jensen ends rather whimpishly and non-committally after initially warning us of ‘real danger’. But the danger he mentions is not that of increased disease, allergic reactions or whatever, it’s simply the danger that we might start to eat GM foods, something which is already occurring in the USA and elsewhere, and which has not, so far, been shown to be problematic after 15 or so years of intensive and sophisticated monitoring. Jensen’s language gives a subtle indication of his sympathies without furthering the debate in any way. The key sentence is in the middle: It can be seen as a natural extension of what man has been doing since he first domesticated wild plants for food production or, as so many believe, it is a line that should never have been crossed. The phrase ‘as so many believe’ suggests that he is one of those believers, but he doesn’t seem prepared to commit himself overtly. This means he absolves himself from arguing why the line should never have been crossed, or what the line actually is. There were times, I recall, when heart transplants were considered a devilish crossing of the line, and of course cloning also brings up these sorts of arguments. Usually the line has something to do with ‘playing God’ – you’ve crossed the line that separates humans from gods, even pretend ones. Considering that gods don’t actually exist, it’s hard to know how to respond to such thinking. Perhaps you can remove gods by saying that the line separates the ethical from the unethical. It might’ve been argued, by some, that putting a foreign object, such as someone else’s heart, into an enfeebled human body in order to re-invigorate it and provide it with a few more relatively healthy years, was simply unethical, and on that basis, splicing a foreign gene into the genome of a plant to make it more productive or pest-resistant is also unethical, presumably on the grounds of ‘naturalism’. To do these sorts of thing is unnatural, it tampers with nature, which has found its own way of doing things, which should be respected. The trouble is, this would rule out all sorts of ‘unnatural’ interventions, including surgery [for anything] and agriculture, which interferes with the ‘natural’ growths of the soil. Building houses to live in is a sort of local interference with nature, as they create tiny microclimates against the natural forces of wind and rain, etc. Clearly the ‘naturalism’ argument is unsustainable. If we hadn’t ‘interfered with nature’ in our inventions and developments, we mightn’t be around today. Certainly we would never have been so successful. So, without invoking gods, I can’t see any intrinsic argument against transgenesis. Can an argument be made in terms of consequences? Well, I’ve already looked at this, here and here and I can only reiterate that the possible consequences of transgenetic agriculture are no different from the possible consequences of traditional monoculture and hybridisation, and that these consequences are being monitored by the World Health Organisation and by other, national, bodies. There is clearly a lot of misinformation being pedalled about GMOs, and the consequences of that are sometimes tragic.